Dr. Hoar spoke at the University of Lethbridge. 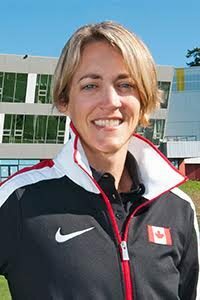 She is a mental performance consultant with the Canadian Sport Institute Pacific and the National Coaching Institute Victoria. She is also the sport science and sport medical lead for Triathlon Canada, all while also continuing her own research within emotion and sport. The seminar she held was called Growth Mindset: Unlocking the Pathway to Performance Success. The idea behind the growth mindset, a concept brought forth in large part by Dr. Carol Dueck, is the state of mind that one has that no matter the situation, you can always improve. That you can, with the time, attention and effort, change the situation you may be in. Furthermore, it is the idea that you are constantly getting better and not limited by any restricting factors. This is the opposite of a fixed mindset, or the idea that you’re born with all you ever can be in terms of ability and potential. Or that no amount of training, dedication, or perseverance will change what you are cut out to be. Right away, it seems obvious which mindset you want in order to facilitate your own athletic and personal growth. Getting into the growth mindset can be done by focusing on the how, not the what. By focusing not on what you need to do, but how you need to get there, you’re opening yourself up to the process and the associated goals that will help you reach your success. By setting up goals which highlight how you’ll be successful, you’re allowing yourself to see your growth, development and potential along the way. You set those goals, and therefore you can make them as challenging as you’d like. So, now that you know you need to be in this mindset, how do you get there? It seems easy enough, be more positive and open about how I’m going to progress and succeed. But we all know it is not as easy as that, now don’t we? One tool Dr. Hoar mentioned she uses with the athletes she trains, on a daily basis, is that they debrief following their training. When teaching them how to debrief, she focuses on the power of three, and has them think of two things that went well, two things that they learned, and two things they’re going to work to improve. By completing this, athletes are able to see their training session as a complete picture, and it allows them to create positive and growth-focused thoughts about their training. Remember, in keeping in the growth mindset, you are constantly striving to be better than you were yesterday. And with no caps on how high you can go, establishing this mindset will allow you to strive for the stars. Another technique that Dr. Hoar presented in order to maintain the growth mindset is to reflect daily on three positive things about yourself every day. Three things you’re proud of, three things you accomplished, learned, or even experienced that you felt had a positive influence on your development. By focusing on these positive attributes, you’re re-affirming to yourself that you can be successful, that you have desirable traits and that you are worth investing in. By constantly reviewing yourself and your development, you’ll help to keep that growth mindset strong within yourself. The idea with maintaining a growth mindset is not to give you one more thing to accomplish. In fact, it is the exact opposite. It is establishing the attitude, effort and perspective that will drive you to push harder and get that much better. Along with your motivation for why you train and compete, it is the fire inside you that can burn so strong that you become untouchable. With this mindset and framework for success, there is nothing stopping you and there is nothing that you can’t achieve. Step back to figure out how you can adapt this attitude as well, and then watch how far you can go.